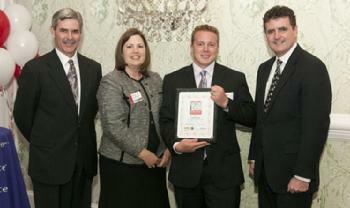 for being named Bucks County's Top 40 Under 40! G R Flooring�s Greg Roman (third from left) receives an award from President and General Manager of Greater Philadelphia Media Mike Jameson (left), Community Affairs Director for the Bucks County Courier Times and Intelligencer newspapers Amy Gianficaro and Congressman Mike Fitzpatrick (right) during the Bucks County Forty Under 40 awards banquet. G. R. Flooring and Contracting is a third generation family owned and operated company providing excellent service to Bucks, Montgomery and surrounding counties in Pennsylvania. We appreciate the eagerness to expedite home improvements so we strive to return calls and emails the same day. Our streamlined estimate process will get you to your finished product quicker. During your site inspection with our owner, you will be given a full explain of our products, procedures, answers to your questions and will promptly have a customized quote emailed to you. The owner of the company will be your contact through completion. With other companies you may deal with 5+ people by the time your job is measured, sold, scheduled, then passed off to a subcontracting company. Who do you talk to if there is a problem? Many other contractors have a revolving door of staff so you don't know who is showing up to your home, if they are properly insured, trained or have a criminal history - the hiring company might not even know. We do not use subcontractors - All of our staff are long term full-time employees of G R Flooring. You can rest assured you never have to worry about who is coming to your home or information getting lost in translation. We pride ourselves on our clean appearance, workmanship and personal service. Our equipment is the highest technology available in the industry and we provide only the finest quality materials and professional line of finishes for our projects. Our knowledge, quality of workmanship, personal attention, affordable prices, customer service and equipment/products we use cannot be compared. Our goal is to make your home improvement project hastle free. a wide selection of samples and product information. Since we perform all our own work, we can provide a higher level of quality control and greater cost savings. Highlight your home"s architecture with the expert advice of interior design specialists and top home decorators.